LASIK, PRK, the implantable contact lens, and refractive lens exchange are the appropriate procedures for almost everyone. There is a variety of other procedures, some of which are obsolete and some of which are still relevant, but they are less commonly done. The full spectrum of refractive surgery is shown in Figure 9 on page 16. In addition to laser corneal surgeries, there are also incisional corneal surgeries. Radial keratotomy, the old Russian procedure, is one example, but is obsolete now. 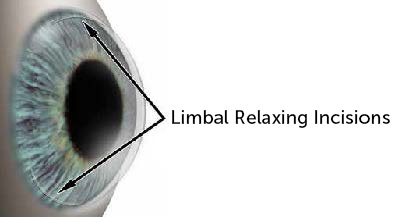 Limbal relaxing incisions are a cousin procedure that is very much used today. One or two small incisions are made at the edge of the cornea (Figure 14). Limbal relaxing incisions are a good way to correct low to moderate amounts of astigmatism in combination with RLE or an ICL. Figure 14. Limbal relaxing incisions are small incisions made at the outer edge of the cornea. These incisions cause the oval cornea to relax, transforming it into a round shape; this change in shape corrects astigmatism. Another nonlaser option, corneal inlays, are tiny clear lenses that are inserted into a pocket in the center of the cornea. The inlay acts like a tiny reading lens and is designed to correct presbyopia, the loss of reading vision that occurs with age. This is a new procedure, not yet approved at the time I’m writing this.